I’ve brought some vibrant colour today with a brand new image from Marcy at Power Poppy called Ruffled Wild Orchids! It is a gorgeous new digital image in the Instant Garden, and so very beautiful to colour. As with most floral images, the first time I colour it, I tend to look up what might be some possibilities first, so I have a good reference point for my colouring. I found a gorgeous Cattleya hybrid orchid that was my jumping off point below. 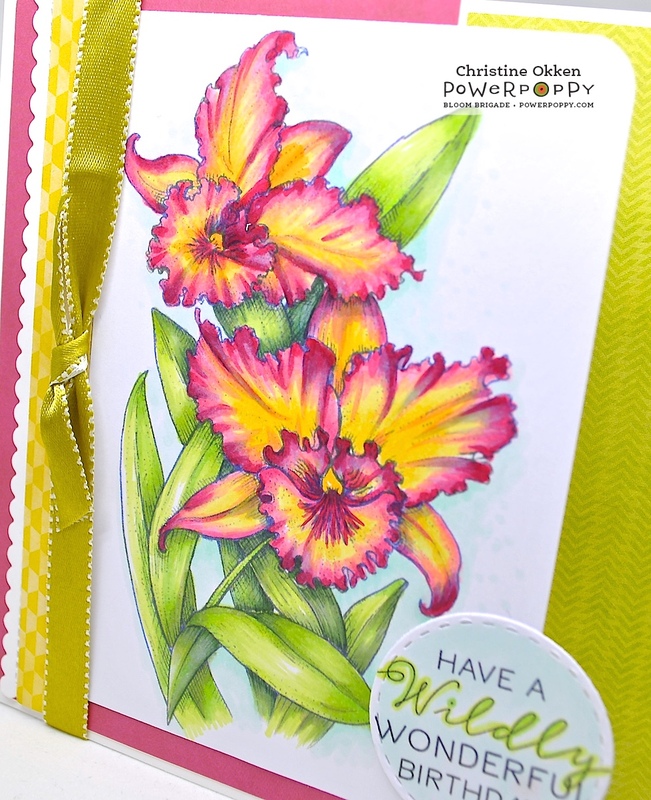 I just loved how the flower combined deep pinks and bright yellows together in this orchid, and the deep greens of the leaves make for one sunny design! I also played with a different fold for this one. A bit of a Z fold. All you need to do is take and 5 1/2 x 8 1/2 inch card base, score and 3 1/2 from both ends and then fold in a Z design (one mountain fold, and the next a valley fold). This forms about a 5 1/2 x 5 1/2 inch completed card. Details are very simple with patterned paper doing most of the work as well as a little bit of a scalloped edge and some satin ribbon in a bright green. Here’s a closeup of the colouring where you can see the places I added a BV00 copic to the edges to dull down the depth of the pink and to create some shadowed areas, as well as using a couple of types of green to simulate light and shadow. Pop on over to the rest of the Instant Garden and Bloom Brigade playing along with some more wildly wonderful Orchids today too! GASP! Christine, this is gorgeous!!! GORGEOUS! Christine, this is stunning with the beautiful colors you've used...right from nature. That's often what I do, and you've nailed it. 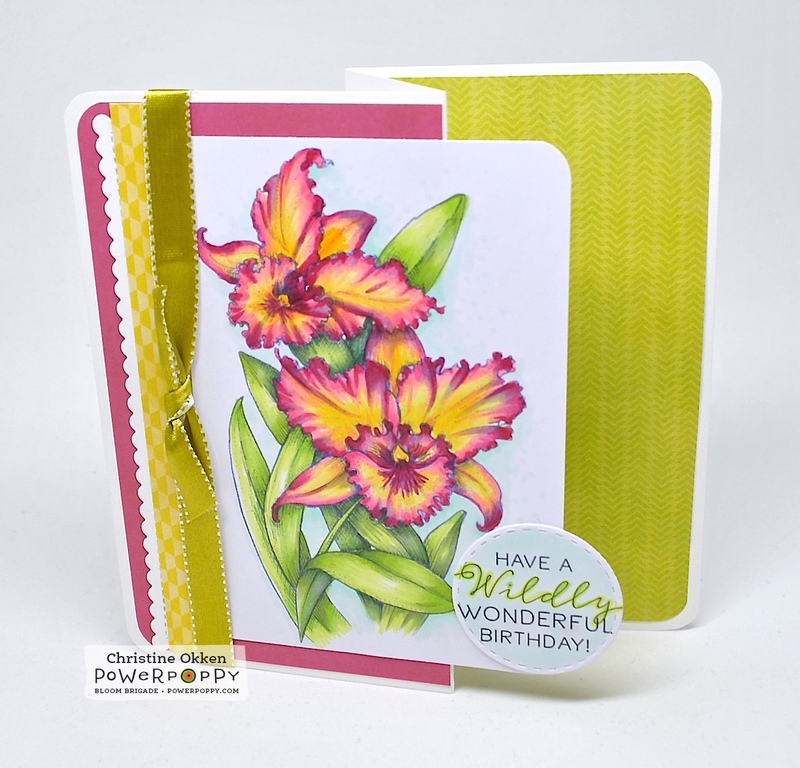 Beautifully colored and a really great layout and card fold!! Love it! Hugs! Love your inspiration photo and your image and card turned out fabulous. Such beautiful colors. Thank you also for the kind comment you left on my blog for my entry for this months Power and Spark challenge. Stunning card, Christine! You've captured your inspiration piece beautifully! Your coloring is just gorgeous and your orchids look as if they are being kissed by the sun! I so admire your fantastic coloring on your orchid leaves, they look SO realistic!!! Also I am very impressed with your stripes of vivid color on your orchid blossoms! God creates such beauty in nature, you have captured it so well! As always, I am so very impressed!!! Oh my I am totally blown away how you can capture the colors in the pictures you find and recreate it in your lovely creations, simply Beautiful! Absolutely gorgeous, Christine! 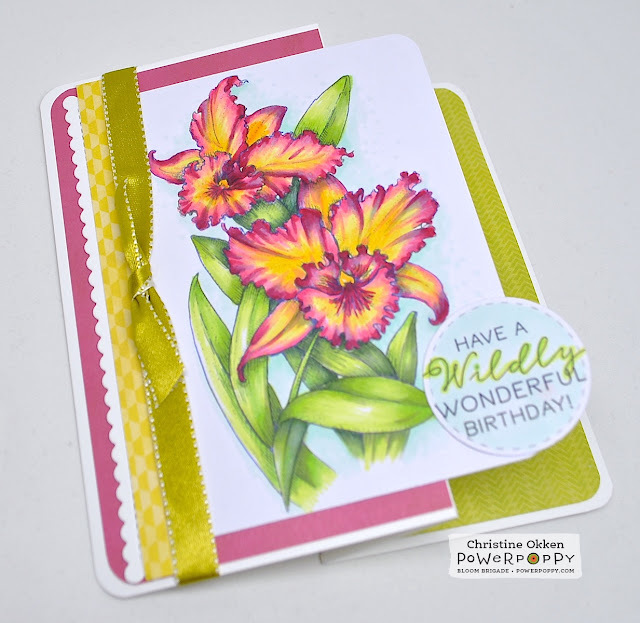 Beautiful colors, coloring, and card design. I love the sentiment with this set, too. Thud... Christine so gorgeous! You captured the color of these flowers spot on. Wow... Great z-fold card too... Gorgeous! 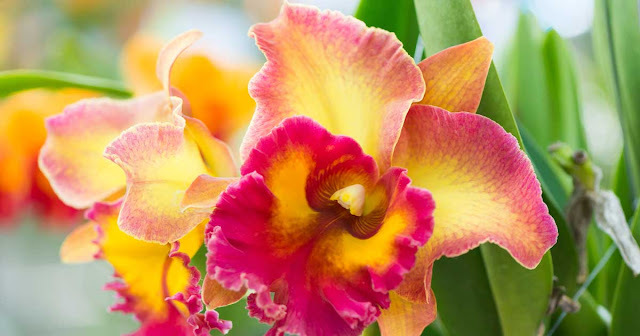 What a gorgeous hybrid that you based your beautiful orchid on!! Fabulous card! !